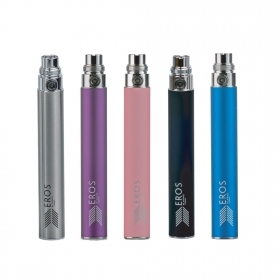 Manufactured to the highest possible standards of safety, performance and durability, Eros 1100mAh batteries are the largest capacity standard battery in the Eros range. 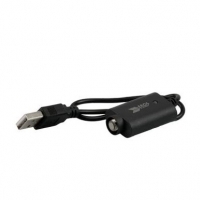 Less than an inch longer than a standard 650mAh battery, the 1100mAh battery manages to cram in nearly double the battery capacity and is popular amongst customers who like to go as long as possible between charges. Available in Black, Pink, Blue and Stainless Steel, all batteries & chargers sold by Mirage are subject to a 30 day guarantee against manufacturing faults. 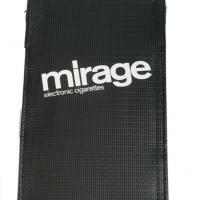 Although many electronic cigarette batteries now look the same, Mirage batteries are all manufactured to the highest possible safety standards available and undergo full certification and quality control testing. It is a good idea to dry the battery before charging as there might be condensation or E-liquid collected in the top of the battery. Use a cotton bud or tissue paper to make sure the battery is completely dry before screwing on to your charger. It might only be a couple small drops of condensation, but water and electricity do not mix. Only use a Mirage charger with Mirage batteries. Do not mix and match parts from different electronic cigarettes. Each charger and manufacturer has a different output rating, and different safety standards. Using the wrong charger could damage the battery and could potentially cause it to overheat. Mirage batteries are designed to only be charged with our USB charger on a computer or our UK plug adaptors. Without exception - we do not recommend charging our batteries with any other plug adapter. When charging a battery charge on a non-flammable surface away from any clutter. 4. Never leave a battery charging unattended. 5. Never leave a battery charging overnight. 6. Do not overcharge the battery. It is important that you do not overcharge your battery. When the indicator light is green remove the battery from the charger straight away. Batteries can be damaged by drops, knocks, extreme hot and cold temperatures, exposure to dirt or water. If you know that your battery has been potentially been damaged in anyway, do not use the battery under any circumstances. We now recommend that all batteries, without exception, are charged in a charging bag available below.